Pear shaped diamonds have a unique, sophisticated glamour. This brilliant diamond shape has been around for hundreds of years, gracing the hands of royals, starlets, and style-setters throughout the ages. Today, the pear shaped diamond is actually one of the least commonly worn diamond shapes— making it the perfect choice for someone looking for a more distinctive, eye-catching diamond. 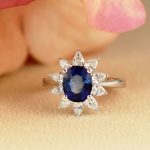 If you’re considering the unique, chic pear shape for your ring, there are few things you should know when shopping. We’ve put together this “need to know” guide for buying a pear shaped diamond to help you pick your perfect pear. Pear shaped diamonds, also known as teardrop diamonds, have a rounded shape that forms into a tip, giving them an elegant look. 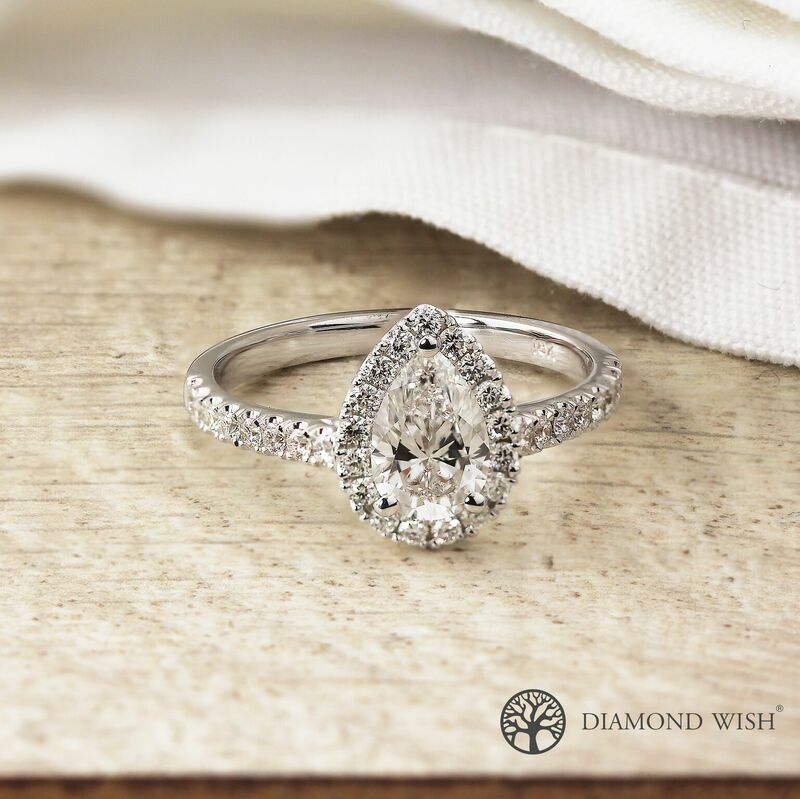 This diamond shape is cut with a modified brilliant cut that combines the round brilliant cut (on the pear’s rounded side) with the marquise brilliant cut (on the pear’s pointed side). Head: The rounded end of the diamond. Shoulder: The curve from the round end to the center of the diamond. Belly: The center section of the diamond. Wing: The narrowing curve that leads to the diamond’s point. Point: The pointed tip of the diamond. It’s important to know these sections so you can understand how they may change shape with different pear shaped proportions, which we’ll talk about next. The proportions of a pear shaped diamond greatly affect the look of the diamond. Which proportions you find most beautiful are completely up to your personal taste, but we’ll talk a bit about what most people prefer. When considering a pear shaped diamond’s proportions, there are two things you should keep in mind: length to width ratio and symmetry. Most people prefer pear shaped diamonds with a length to width ratio that falls between 1.5 and 1.75. However, some people prefer more elongated or more rounded pear shaped diamonds— again, it is a matter of personal taste. In regards to symmetry, most people prefer pear shaped diamonds that are as symmetrical as possible, with identical shoulder, belly, and wing sections on both sides. Since pear shaped diamonds have an irregular shape, with one pointed and one rounded side, many people wonder how they should be worn. 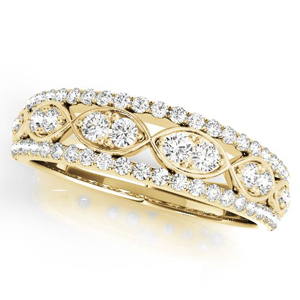 Traditionally, on a ring, the pointed end would be worn outward toward the fingertips. However, some people prefer an inverted look, with the tip pointed in toward the wrist. 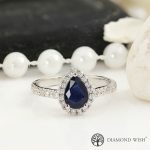 There’s really no wrong way to wear it— you should simply wear your ring in whichever direction you find most beautiful. A good cut is extremely important for any diamond, as it has the largest effect on how a diamond captures and reflects light. When buying a pear shaped diamond, there’s a specific cut you may want to look out for: one that minimizes the “bow tie” effect. Because of the way pear shaped diamonds are shaped and cut, they will have a shadowy, light gray or black bow-tie-shaped area near their center. 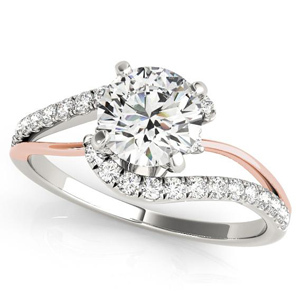 The same is true for a few other fancy shapes, like heart, marquise, and oval diamonds. While this “bow tie” effect is always present in pear shaped diamonds, you can look for a cut that minimizes the effect. We’ll end our guide with one of the most commonly asked questions about pear shaped diamonds: are pear shaped diamonds cheaper than round diamonds? Yes! 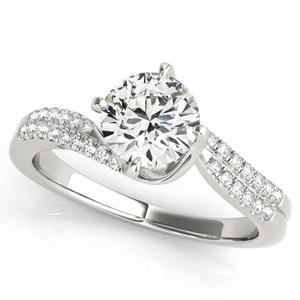 Pear shaped diamonds are generally cheaper than round diamonds of the same carat and quality. This is because pear shaped diamonds usually produce less waste when cut from a raw diamond. 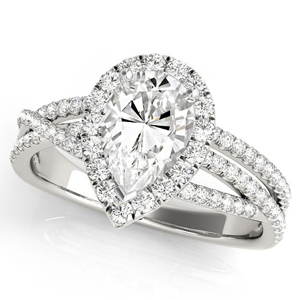 Additionally, pear shaped diamonds will look larger than round diamonds of the same carat weight. Pear shaped diamonds carry more of their size on their table (their top), which makes them look bigger. 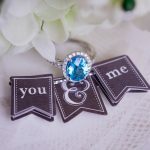 So, pear shaped diamonds are not only unique and beautiful, they’re also a great way to get a larger looking diamond for a better price. 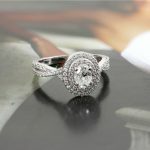 Experience the distinctive beauty of the pear shaped diamond: browse our pear shaped engagement rings.